Edwardian blouse. Front bodice has a panel of cotton lace work in white as does the collar and half sleeves to match. It could be worn if you had a jacket over the top and just used it as a blouse front. White cotton night-dress in very good condition. Shoulder to hem 52". Original 1980s Laura Ashley Made in Rep of Ireland label. 100% Cotton, Machine washable. Label states UK size 10. EUR size 38, USA size 8. This Edwardian style short jacket features a stand up collar with pleated shoulder button cuffs. Vintage 70s/80s Laura Ashley dress 12 floral print prairie . Concealed zip to the back. Pit to pit laid flat measures 19 inches, with extra room for bust. Pictures 10 and 12 are the closest to the colour. Waist measures 18 inches laid flat. Dispatched with Royal Mail 2nd Class. 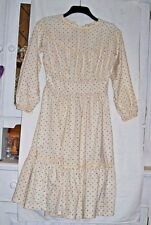 This is a BEAUTIFUL VINTAGE LAURA ASHLEY COTTON PRINT PRAIRIE DRESS SZ12 Made In Wales. It has hardly been worn and is in very good clean crisp vintage condition...It is trimmed with cotton lace and has leg of mutton sleeves with real mother of pearl buttons. This is an Antique, probably Victorian,Edwardian, White Cotton Nightdress,Nightie in Good Condition for its age . It has Hand Embroidery Featherstitch to the Flap on the front opening which is then finished with Swiss Lace and Embroidered Swiss Lace to the Neck and Sleeves. Freshly laundered corset cover, in excellent condition. Lace trim to neck and armholes, with blue ribbon slotted through a ribbon run at the neck. There was a small hole in the lace on one of the armholes when I took the photos, but I have now repaired it. French Connection Trench Coat, Brushed Cotton, Dark Teal Blue. Needs a dry clean and also the lining is frayed inside the sleeve. Chest measures 45cm laid flat armpit to armpit Length: 96cm Please see my other items for other lovely coats! It's even got a spare button still attached inside! It opens along the front and like all cardies you can either close it up again or leave it open. The label says it's 100% cotton and it's washing instructions are: Wash 50 degrees, warm iron, reshape while damp, dry supported, do not tumble dry. A lovely Original Victorian Night Dress. Loads of fabric in both the dress and sleeves. 1890s Original White 100% Cotton Victorian/Edwardian Nightdresses & Shirts Handmade. There is also a repair at the front half way down. 1971Laura Ashley maxi Prairie Styled Dress. Very Unusual Colour as it is Very Dark Green size12.and bust measures 32" Waist 25 inch and full skirt so up to 38hip..The length from gathering of waist to hem is 44" The sleeves are about 6 inch wide at wrist end . it was packed in an old box..with real old feather Boa .And so a fluff attached in places . Though I am working on this. As comes off .. easy. This item has been put away securely and smells clean . Please view photos carefully and contact me if you have any questions as I do not refund But I will post off promptly.. and wrap up carefully Thank you Offers considered over start bid Condition is Used. Dispatched with Royal Mail 2nd Class. The red spots aren't actually in the material, they are on it, whether stitched or stuck on I do not know. The suit is old, probably 1970s I would think or 1960s but is in very good condition as hardly worn. In excellent condition, ready to wear. Get images that. make Supersized seem small. Rubs to raised areas, front placket and cuff and collar edges, here the fabric has a chalky bloom. Circa late 1960's early 1970's. The dress is made from raspberry cotton seersucker with violet reverse to collar and waist tie. Beautiful green floral cotton Laura Ashley 1980s Edwardian revival dress Size 12. Early 20th Century Edwardian Nightgown. Condition is Used. The nightdress is about100 years old so has a few issues, mainly due to minor areas of discoloration which would likely be removable, as well as a repair to a tear in the left shoulder. This item also has modern buttons rather than original metal buttons. Size 14 - 20. It is a loose, generous sized garment. To be sent by Royal Mail 2nd Class. The sleeves are puffed sleeves at the top and are gathered into 2" deep cuffs, which are fastened with a presstud. I have been working at reducing these with an oxystain soak, and they have been reducing in these, and they have faded. LOVELY GREEN PIPING ON PETER PAN COLLAR & CUFFS. PLEATED DETAIL WITH CROCHET ON PANEL. WORK OR PLAY. GOOD CONDITION. A VERY PRETTY YET SMART CASUAL OR FORMAL TWO PIECE SET CONSISTING OF SHORT SLEEVED BOLERO STYLE JACKET WITH FULL SKIRTED BEAUTIFULLY SHAPED STRAP SLEEVED DRESS. THE DRESS HAS A PANELLED BODICE AND A V FRONT NECK AND BACK (ZIP FASTENING ON THE SIDE OF DRESS). Material Cotton - Liberty print fabric, Liberty of London. This dress is unlined with a back zip fastening. Clothing style: Victorian. side pockets with black trim, long sleeves with black trim (2 buttoned but 1 button missing from each sleeve) back zip. Original label - Laura Ashley Made in Wales so was made in the original Laura Ashley factory. Quintessentially Laura Ashley and so very romantic. The back is plain with 6 pearly buttons to fasten. Footwear is always sent in a box. In pink with lace collar. It has six ivory buttons down the mid front of the bodice (see close up photos). The light weight duck egg green cotton fabric has a beautiful shades of purple, coral and off white abstract floral pattern. No size, but would best fit a UK 8-10. Good secondhand condition, with no faults or marks that I can see. The dress is in immaculate condition apart form a bead missing at from the belt lacing at the back. (Two matching beads could easily be replaced). The front of the dress is smocked with 2 pleats and it buttons down the front part way to into the skirt which is lined in polyester. Made in Carno, Wales. Made from a lovely quality black cotton velvet cotton. Slightly dropped waist with button up back, full skirt with scalloped ruched hemline and bow detail. Hidden side pocket. Fitted shape with feature sleeves. Edge-to-edge dipping front with notches and bows to hem. Puff shouldered three-quarter sleeves. Floral print cotton fabric, fully lined. A Laura Ashley feel. Welcome to Ditsy Vintage where each item is handpicked by me to bring you super vintage fashion to your doorstep. I am pleased to offer for sale this beautiful English rose dress from Laura Ashley from the 1980s. Inspired by the Victorian period, this dress is a size 8/10 uk. Excellent condition with no faults to mention. Any questions please ask. Fully lined, side zip, Scalloped back with oversized bow. HIP = FULL CIRCLE LENGTH = 50". Overall this piece looks great and are confident that you will love it. We are only human and may make a mistake once in a while. Laura Ashley Vintage Day Dress Prairie Dress Midi Dress Label Size 12 Fit UK 10? Approx Fit UK 10. Label Size 12. Victorian / Edwardian Style High Neck. The print is very subtle and is of flowers. The dress isn't pillar box red & I cant think of anything to liken the shade to. immaculate, unaltered. So this one has a square neck & back, with long zip down back.